Now that the election in Burma/Myanmar is over the military junta that rules the country has returned to fighting the ethnic minorities. Fighting between the army and the DKBA (a group that before the elections had accepted a ceasefire and were to be integrated into the Army structure) has driven thousands of people from the town of Myawaddy (across the river from Mae Sot in Thailand). The Thai military are trying to stop them crossing, so many are camped on the riverbank. …our area here (Pho Phra) which 5 km from DKBA headquarters, so many people from that side now crossing to Thailand. For sure the fighting will start sometime. That why many villager are now crossing. Some of the villagers contact me to help them and prepare some place for them to stay. It is really hard for me because it is depend on the Thai authority. Any way as you know we are the only school which is close to this border, so for those children who want to continuous their study will come to our place. We need your payer and your help. Share the news to keep pressure on the government not to do any action of war if their election is true democracy and peace. We are nothing but we can do something through the One Who strength us. Partners NZ (a relief and development agency who help support the school Peacefully runs) are sending supplies and food to PhoPhra. I’ll try to post updates as I get information. Please do pray for him and his friends at this time! As well as for the overall situation in Burma. After they heard from rangers guarding the Nong Bua temporary shelter that refugees would be relocated to another temporary shelter at Usutha on 8 March, 29 refugee families have fled the shelter. For over a month, the refugees have waited for the authorities to solve the problem of ‘forced repatriation’. Rumours from military personnel forced them to flee to other Thai-Karen villages, while some of them went back to Burma in order to sneak back into Thailand at other spots. There had been 105 families at the Nong Bua shelter, until rumours starting in early March prompted 29 families to move out between 5 and 8 March. 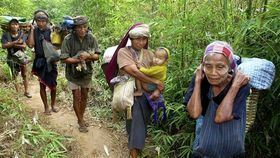 Free Burma Rangers, a group that seeks to bring aid and hope to IDPs inside Burma sends regular reports. As you’d expect they are often graphic and usually news of yet more atrocities. Somehow their latest report brings home the inhumanity to which the Burmese Junta’s war on the ethnic minorities has descended over the years. 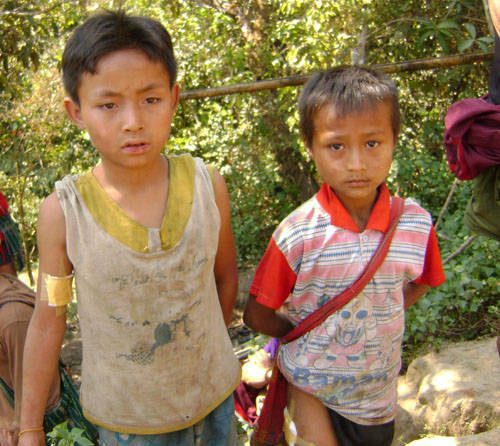 On 19 February, 2010, Burma Army troops from MOC 7 attacked the school at Ta U Plaw and wounded Saw Eh Kaw Thaw, 12 years old, and Saw Ree Re, 10 years old. You can read the full report here. If you look at the pictures or use your imagination it will bring tears to your eyes. An FBR report was just published with pictures to fill out the text report in the Irrawaddy cited below. Burmese government troops have stepped up their attacks on Karen civilians, burning down dozens of houses and a clinic and forcing schools to close and around 2,000 Karen villagers to flee into the jungle, according to Karen relief groups. The troops burnt down more than 70 houses in several villages in Kyaukkyi Township in Nyaunglebin District, Pegu Division, as well as one mobile clinic, said the Committee for Internally Displaced Karen People (CIDKP). The troops separately entered six villages from Feb. 3 -7, burning down 46 houses in the Toe Hta area and 28 houses in the Ka Di Mu Der area, according to the CIDKP. On Feb. 5, a villager, Saw Law Ray Htoo, was shot on the Salween River and later died at a hospital in the Mae La Oo refugee camp on the Thai-Burmese border. mobile health clinics are always targeted by the Burmese government troops because they provide life-saving services to Karen and other ethnic minority villagers.